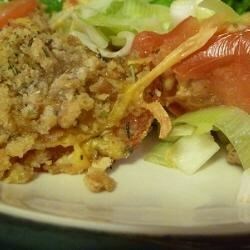 "Leeks are layered with tomato slices and mozzarella cheese, and topped with herbs and crushed crackers. This simple casserole is a great accompaniment to a summer meal!" In a small bowl, mix crushed crackers, rosemary, thyme and sage. Bake 30 minutes in the preheated oven, or until golden brown. My husband and I really liked this dish. There was a little liquid in the bottom of the pan but I just spooned it out. I will make this again. This was really good, but kinda' soupy. It would have been very good with rice as a bottom layer, which could have soaked up some of the juice. This was really, REALLY good! Even my mother-in-law liked it. I was generous with the crushed crackers and it turned out great. Thank you! I thought this was really yum, but my family wouldn't eat it! More for me!